On Tuesday, Minnesota’s home care workers etched a new chapter in the state’s history, alongside the miners who organized the Iron Range, the truck drivers who shut down Minneapolis in 1934 and the women who led landmark strikes by teachers in 1946 and 1970 and by nurses in 1984. Ballots were mailed to 26,000 home care workers Aug. 1 in the largest union election in Minnesota history. When the state Bureau of Mediation Services counted the ballots Tuesday, 60 percent of those voting (3,542 out of a total of 5,872) chose SEIU Healthcare Minnesota to represent them. “Despite every obstacle put in our way, we stuck to our promise to keep fighting until we were able to exercise our democratic right to let home care workers decide for themselves whether to form a union,” said Sumer Spika, a home care worker from St. Paul. To gain the right to organize, the workers mobilized to push the Legislature to change state law. They endured court challenges bankrolled by the National Right to Work Committee. Workers knocked on hundreds of doors and engaged in thousands of conversations to gain support for the union. 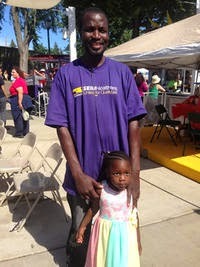 They celebrated Tuesday when the results were announced before a large crowd at the Minnesota AFL-CIO Labor Pavilion at the Minnesota State Fair. “After years of struggle just to get a vote, today we are so excited to have won our union!” said Rosemary Van Vickle, a home care worker from Crosby. “With our collective voice, we will be stronger in our fight for improvements for both workers and the people we serve." Key issues in the organizing were better pay and benefits for home care workers, more access to training and improved quality of care for their clients. The workers said they will now begin the process of negotiating with the state of Minnesota on these issues. The members of the union are personal care assistants and other home care workers providing direct support services through client-directed, government-funded programs. “When workers voted yes for their union, they were voting Yes for a better life not only for themselves, but also for families like mine,” said Nikki Villavicencio, a home care recipient from Maplewood who attended the press conference with her husband and daughter. Their efforts echoed the struggles of the past. Miners on Minnesota’s Iron Range were subjected to decades of attacks by employers and law enforcement before finally winning union representation in the 1930s. Bloody battles by Minneapolis truckers and warehouse workers – including four deaths – were among the factors that led to passage of the country’s most sweeping labor law, the National Labor Relations Act in 1935. Teachers whose work was undervalued walked out of their classrooms in St. Paul in 1946 and Minneapolis in 1970 in illegal strikes that eventually led to huge reforms in public education and public sector labor law. And a strike by Minnesota nurses in 1984 drew national attention to the problems facing workers in health care and women workers in particular.